Straight from the Southern Most Port of the country, General Santos City will be celebrating its annual Tuna Festival this September 1-5. Aside from being the Tuna Capital of the country, General Santos City is the hometown of pinoy sports hero, Manny Pacquiao, and considered as the Boxing Capital of the country. The Tuna Festival came to live due to the unplanned gathering of the city’s tourism association, where they showcased mouthwatering tuna cuisine through culinary contest and exhibition. The festival itself is a massive display of the bounty of the sea. 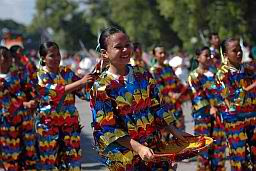 In line with the city’s celebration of the Tuna fest is the “Parada sa Dagat” (Parade in the Seas) which showcase the love of the Gensanians to street dancing. 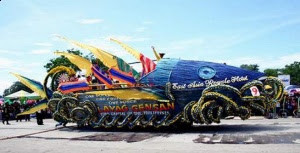 Likewise massive floats in “Higante sa Dagat” (Giant in the Seas) competition, which is quite the culminating event, are considered as the festival’s showstopper in the annual event. “Carerasa Dagat” (Race in the Sea) was also realized to kick-off the festival, and the “Pamahaw ug Pasalamat” (Breakfast and Gratitude) is hosted by the local government as part of the closing ceremony. Being in the southernmost of the country and along the basin of Sarangani Bay, Gensan is an hour and 45 minutes plane ride from Manila. Aside from pampering them with Tuna dishes, General Santos has a lot to offer to tourists visiting the SOCCSKSARGEN region. Its metropolis is a home for many industrial amenities. Plus, it has the proven itself to have the gift of nature’s beauty and diverse culture. It’s also the home of the Klaja Ecopark, the name was derived after a visayan term “Kalaha” with means a cooking pan. The word modifies the Tower of Karst formation. And, if you want to have an entire look of the city, you might as well go to Nopol Hills and have a small camping activity.